The Speed combines sporty performance with terrific value. Year after year it remains our most popular bike because of this. The frame is hand-welded from custom-drawn 4130 chromoly Sonus tubing and incorporates six different patented technologies, resulting in what is probably our stiffest frame. The Speed D3 model even features the BioLogic™ PostPump, a seatpost that integrates a large volume floor pump – so you’ll never again need to worry about leaving your pump at home. 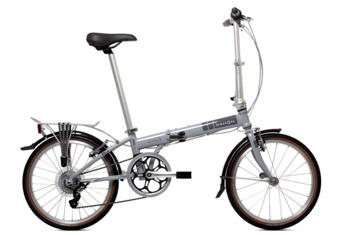 Gear Inches: 34" - 92"
Dahon requires all of their bikes to be checked and adjusted by a trained bicycle mechanic before riding. This activates the warranty and you can then upgrade to a lifetime warranty simply by sending the warranty card in. Without this service, you'd have to bring your bike down to the local bike shop for a tune up before riding and you'd get charged up to £30. We offer this service for free, so when you get your bike from us, all you have to do is unfold it and you can start riding.